Bestselling writer Aleš Kot (ZERO, THE NEW WORLD), artist Danijel Žeželj (STARVE), and Eisner-winning colorist Jordie Bellaire (REDLANDS, PRETTY DEADLY) introduce readers to a near-future dystopian America in DAYS OF HATE: ACT ONE this July. PORTLAND, OR, 5/29/2018 — Bestselling writer Aleš Kot (ZERO, THE NEW WORLD), artist Danijel Žeželj (STARVE), and Eisner-winning colorist Jordie Bellaire (REDLANDS, PRETTY DEADLY) introduce readers to a near-future dystopian America in DAYS OF HATE: ACT ONE this July. A terrifyingly realistic dystopian tragedy in the vein of The Americans and The Handmaid's Tale, which the The Onion's AV Club describes the DAYS OF HATE story as a "speculative fiction that doesn't pull punches" and IGN calls it "a beautiful and haunting look at a very troubled world." 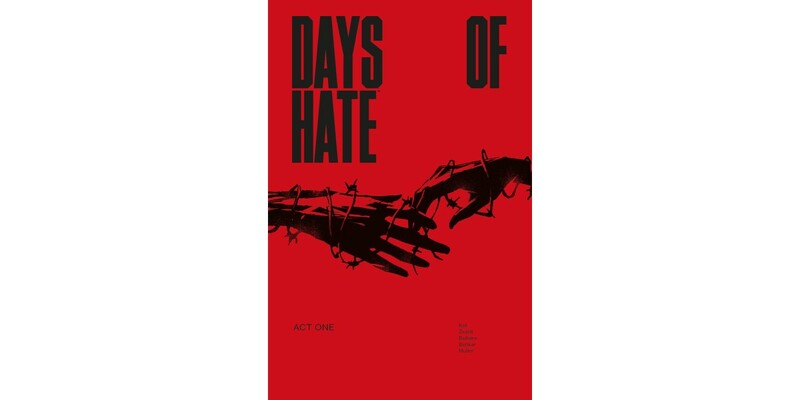 DAYS OF HATE: ACT ONE (Diamond Code MAY180060, ISBN: 978-1-5343-0697-4) hits comic book stores on Wednesday, July 18th and bookstores on Tuesday, July 24th. The final order cutoff for retailers is Monday, June 4th. The trade paperback collects chapters #1-6 of the twelve-part series.